Welcome to the home of the Win Drop! Sign entering our parking lot. A person you can trust! A salesman that keeps the promises he makes! But small enough to give you personal attention! A chemical company that really cares about your needs! A chemical company that brings solutions to your problems! THIS IS A DAY THAT SELDOM COMES!! company with over 35 years of experience in the manufacturing industry. Our company is committed to offering Quality Products, Affordable Pricing and Personal Service by offering a variety of products specifically designed for your manufacturing needs. 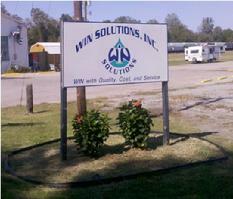 Win Solutions, Inc. is able to offer quality products and affordable prices because we manufacture our products on site. Since we do not rely on outside manufacturing of our products this allows us to control cost and quality. Manufacturing our own products also allows us the flexibility of “custom blending” a product for a specific customer and not having to rely solely on “Off the shelf” products. Win Solutions, Inc. also offers Toll Blending services. We offer blending of customer formulations as well as Private labeling our product line. The overall design represents a Drop of Liquid Solution. The colors represent Environmental Friendliness. The WIN represents a Winning Attitude and the family name. The I is a symbol representing Research & Development. Look for the "WinDrop" in your future. Click the BBB logo to see our rating.